First of all, let’s answer the most important question: what does Sic Bo mean? It means “precious dice” and believe it or not; this is the “English” name of this casino game. It is known as dai siu, tai sai or hi-lo in China, where it’s originally from. It is hard to track the exact origins of Sic Bo; we just know that it is a dice game specific to Chinese culture. Sic Bo is probably thousands of years old, it may even be the first casino game ever invented. It is very popular in Asia, especially in Macau casinos. Sic Bo entered the United States in the early 20th century by Chinese immigrants and today, most of the casinos are offering it. There are digital Sic Bo games too, which are available in online casinos. As can be guessed by its meaning, this is a game played with dice. 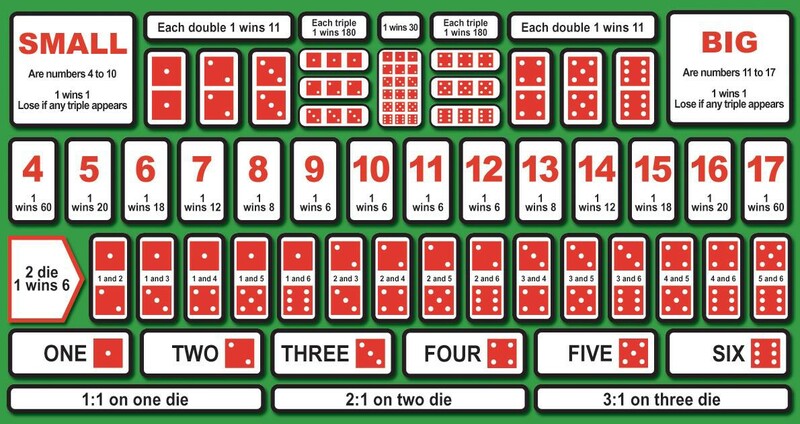 Casino games involving dice are very limited; in fact, Sic Bo is one of the two games available, the other being craps. Three dice are used in Sic Bo and it’s simply a betting game about the outcome of the dices. win — simple as that. Sic Bo is based on pure luck and that’s the main difference of it when compared to craps. In craps, you need to use some strategy because some bets require certain rolls. This is not the case with Sic Bo, you bet — you roll — you win or lose; simple as that. The most common wagers in Sic Bo are “Small” or “Big”. That’s why this game is also called “Hi-Lo”. Basically, you bet on that the outcome of the dices will be between 4 to 10 or 11 to 17. The Chinese (and original) version of the game is a little bit complex than Sic Bo, because the table has much more betting options and the payouts are plenty. To be honest; there are none — this game is based on luck and nothing else. But mathematical analyses show us that the probability of “Big”, “Small”, “Odd” and “Even” bets are %48.6. So it is recommended to bet on these outcomes. Three Dice Total (4 to 17) and Specific Double bets are the worst, they have a probability of %1.4 only.